I am happy to report that the Something Awful I was so worried about wasn’t awful at all. It was actually quite enjoyable! Quite a few months back, Jess asked me if I’d be interested in running on a relay team her dad was organizing. Being myself I said YES! and then as the start date crept closer, I began to doubt my decision….But I paid my money and signed my name, so there was no way out! 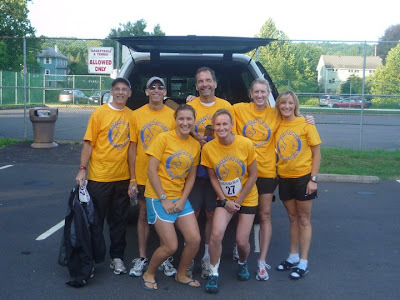 The River to Sea Relay is a 92-mile jaunt through New Jersey along the Pennsylvania boarder. 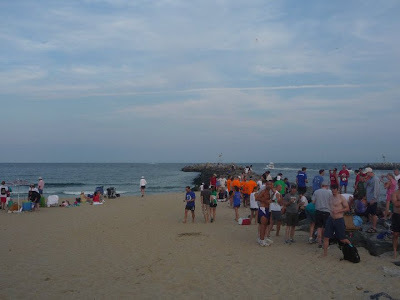 It starts in Milford and ends at the beach in Manasquan. Despite what everyone says, New Jersey was really pretty! 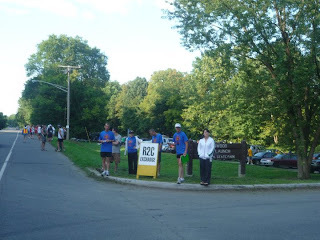 The race ran along the Delaware River, through farmlands, and cute little towns. But before getting into that, I’ll back up and tell you about the weekend from the beginning. On Thursday afternoon I took a bus from DC to Philly to meet Jess (who flew down from Boston) and her friends for dinner at El Vez. The atmosphere was awesome and so was the food! I had Sea Bass Tacos with sweet potato puree (omg I cannot get over how good that was), grilled scallions and fried jalapeno. The portion was really small (just 3 little tacos), but I came away satisfied because Jess shared her Mixed Grill Build-Your-Own-Tacos of chicken, shrimp, and grilled veggies. Yummmmm! Her dad picked us up in Philly and we drove to their house in Newtown, PA. I cannot tell you how nice it was to be in a real house in a town with a backyard and a dog and parents (obviously they’re not my parents, but I haven’t been home since Christmas, so at this point I’ll take what I can get!). Jess’s mom couldn’t decide what kind of cake to make for us, so she made two! A carrot cake and a sour cream pound cake with pineapple topping. Aka fantasticness! (We cake-stormed so quickly I forgot to take pictures - sorry!). On Friday morning Jess took me to a canal along the Delaware for a little run, then we went to Princeton. It was so pretty! 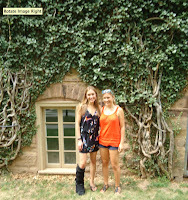 A man took our picture with the ivy on campus (Jess is in a boot because of a stress fracture. But she’ll be back and bootless soon!). After snapping it, he says “Well, check if it came out…I can’t see very well.” Ummm, wouldn’t you say that before offering to take our picture? Saturday night we went to a vegetarian restaurant that was SO GOOD! I’m not usually into vegetarian places because they tend to just stir-fry veggies and add some fake meat or tofu (I’m not hating on tofu, I’m just saying that I can do that myself). But this place was beyond expectations! Creamy green apple-pumpkin arborio rice risotto surrounded by a riot of wild & exotic oyster & shitake mushrooms in a marsala-ancho chile broth with a melted herb-mascarpone center. Finished with organic soft goat cheese or gorgonzola upon request. Sonoma Sampler - Exotic tabouleh grain salad of black beluga lentils & black berry barley, roasted sweet corn, grilled zucchini & pepper-topped with grilled pita hummus, guacamole & sesame eggplant. Goat or Feta cheese upon request. And now onto the race. The team was made up of 7 runners, each running two legs. It was a staggered start, determined by each team’s average 5K times (with the slowest team starting first), so our first runner went at 7:30 am. I ran legs 2 and 9. The first leg was “the BEST” according to the race packet. I ran 8.2 miles along a flat shaded road. But let me tell you, it was hard. I think I ate/drank too much beforehand, so there was some stomach-sloshing. And well, 8.2 miles is a good 3.2 miles longer than the longest race I’ve ever run…All I could think of the whole time was that UGH I have to do this again in the afternoon. I finished faster than I expected. I ran 8.2 miles in exactly 59 minutes, which is about 7:14 pace. Woot! The day flew by, we were constantly driving from hand-off to hand-off. Jess amused her wannabe-running self by doing abs along the way. But the second leg was surprisingly not that bad! I ran 9 miles in 67 minutes, so that’s about 7:25 pace. I started off feeling shockingly good – I was chugging along, actually feeling like running, until I hit 35 minutes and realized that I was only about halfway. Hmm, maybe I should slow down… (because I haven’t done long races, and I’m not in my best shape, I really have no idea how to feel/pace one of these things!). Not that I didn’t try hard enough – by the last mile I was really really ready to stop running. Our team finished just before 7pm at the beach. We claimed our designated two pizzas (of which I ate 3 delicious slices! Hey, I ran the most so I think I deserved it! ), sat around feeling proud of ourselves for a bit, then headed home. I love the feeling of finishing something hard – it’s that yeah, I really did something today sort of well-earned and deserved tired feeling. Oh and that’s not all! This is a pretty epically long blog post – but that just reflects the nature of my weekend. 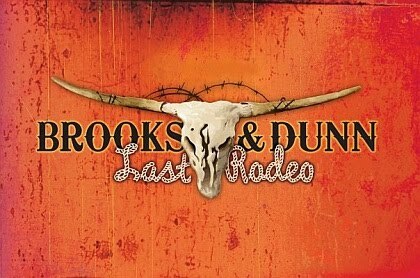 Sunday night I went and saw Brooks and Dunn in VA. You know I love country music! (And if you think you don’t love country, take a moment to listen to this song. And this one. And OMG the list is long!) The concert was re-scheduled from it’s original date at the beginning of July, and this is their last tour ("Last Rodeo," if you will), and there was no way I was going to miss it! So there you have it – the Something Awful was actually fun, and stress-fractures willing, Jess will be running it next year with me (she’s already volunteered to do the longest legs). Not only am I a super-nerd, but I run with nerds too!